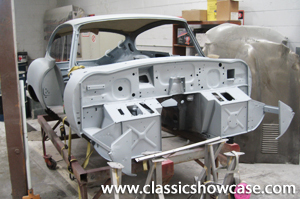 This is a completely disassembled E-Type coupe that has not had any work performed on it, available "as-is", or as a stock or customized Classic Showcase restoration - for more information on our levels of restoration, please visit our Restoration section. The XKE comes with a large list of mechanical parts and components, including but not limited to: the engine head, along with transmission and suspension components and much more. As restoration-ready E-Types are becoming increasingly hard to find, this project car presents a unique opportunity for the do-it-yourself restorer, as well as serious XKE collector who is ready for a customized XKE restoration of their choosing! The E-Type Roadster presented here is an early 1968 model, it is one of the few E-Types that are today popularly known as Series I 1/2 cars as they utilize the open headlight bonnets but are otherwise are very similar to the Series I cars retaining the very favorable 4.2 liter engine. Inspiration from the D-Type is unmistakable, as the E-Type had a monocoque passenger compartment, a tube framed engine bay and a tilting hood. The XKE had four-wheel Dunlop disc brakes with the rear discs fitted next to the differential to reduce unsprung weight and, most importantly, fully independent suspension on all four wheels. For over thirty years, Classic Showcase, Inc. of Oceanside, California has been a global leader in the sales and restoration of the Jaguar XKE (aka E-Type), along with many other select European marques. Classic Showcase has been helping classic car collectors and enthusiasts worldwide to obtain, restore and sell the highest quality turnkey classic vehicles available today. Specializing in the restoration and sale of the classic Jaguar XKE and XK models, our team is also highly qualified with numerous other British, German and Italian makes as well, including but not limited to: Porsche, Fiat, Ferrari, BMW, MG, and Triumph amongst many others. Our dedicated, professional team has been highly trained to cater to every aspect of making our client’s dreams a reality by exceeding expectations and creating works of art. Classic Showcase is where great cars achieve perfection. © 2019 CLASSIC SHOWCASE, INC., All rights reserved. Please enter the term you are looking for.